Save shipping costs on Brady’s Polypropylene Thermal Transfer Printer Labels. Get Free standard UPS Ground shipping in the US when you add an eligible label to your shopping cart. Our Free Freight Friday (FFF) promo is valid March 17, 2017 and runs through Sunday, March 19, 2017. Promo-eligible labels feature various Brady materials for a number of applications such as wire labeling, punch block and patch panel identification, indoor flat surfaces, and more. They are compatible with a number of Brady printers. Please see the individual product pages for more details. 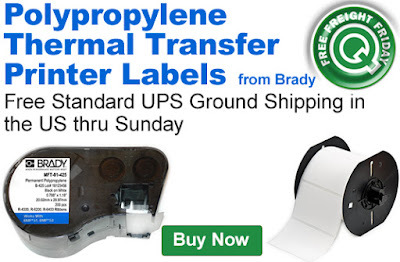 Click here to shop for Polypropylene Thermal Transfer Printer Labels from Brady. For further questions, call us (800-966-6020), or send us an email. Please note: This promo is valid only at QSource.com and expires on March 19, 2017.